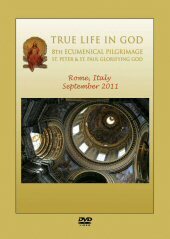 The 8th True Life in God Ecumenical pilgrimage was held in Rome, Italy, in September 2011. On this Pilgrimage we were blessed by the participation of Cardinal Telesphore Toppo, a great supporter of the messages, Vassula's mission, and of Unity. Also attending was Msgr. Rene Laurentin, the famous mariologist and theologian, now in his 90s and blind but who never misses any of the TLIG pilgrimages. Additionally, for the first time, Father Petar Ljubicic from Croatia attended our Pilgrimage. He is the priest who will announce the Medjugorje secrets to the world three days before they occur. A report of the pilgrimage is available HERE.